The main reason to get a travel guitar is so you can have your guitar with you at all times. 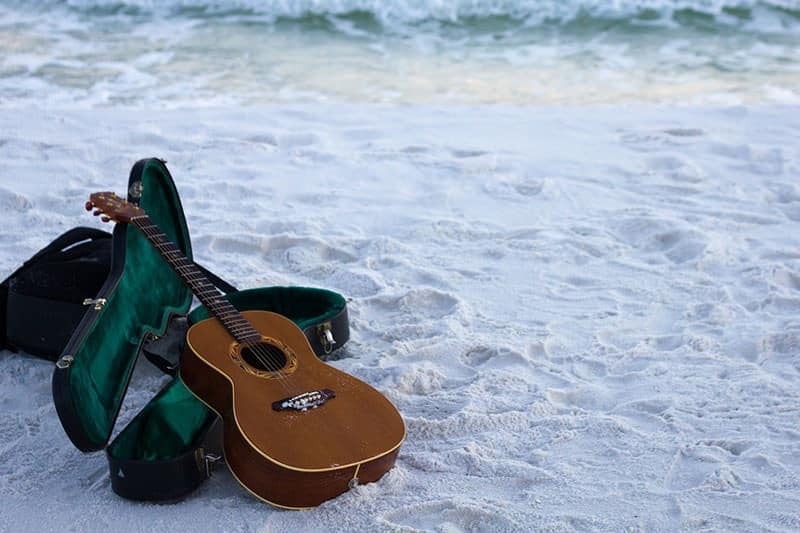 Traveling is perhaps the first thing that comes to mind, but there are a lot of situations where having an extra guitar that is conveniently sized, would come in handy. If you are a serious guitar player, you no doubt have a good instrument or two in your arsenal. These may be expensive guitars, and you do not want to take a chance on damaging them while traveling, or even in some social situations. A travel guitar is just a little smaller than a “regular” guitar but the fretboard is to scale. You won’t have to adjust how you play, but the neck may be a little shorter. Children’s guitars are not to scale, and are smaller than regular sized guitars, so that is the essential difference. They are called travel guitars because that is perhaps their best use. You can put one in your backpack and have it ready at any time you want to play. You don’t have to be as concerned with it as you would your regular guitar, which has a fancy case and can be hard to lug around., A travel guitar is also a little less expensive, so if it is damaged, it is not the end of the world musically speaking. Travel guitars are comfortable and easy to handle. That is a great advantage when you want it available at all times, but need to be mindful of space. Having one also makes music very flexible. You could possibly even take one to work and play a little on your breaks. You can also carry it on planes, trains or automobiles without much inconvenience. With the travel guitar you are always ready to play. Related to flexibility is the extra freedom it provides. You can still have your guitar with you no matter what you are doing. Also think of how you can avoid time wasters. When you are waiting for something or someone, or being delayed for some reason, you can just pull out your travel guitar and practice. There are some travel guitars that have great sound, but nothing will quiet beat the one you have at home that you have been playing for years. You may have to lower your expectation a little bit in this area, but you will still be playing no matter what else is going on, so it may be worth a slight reduction in sound quality to get to play whenever and wherever you want. Another possibility is to go the very cheap route and not worry much about sound quality. This way, you can take your guitar places you might not ordinarily. Take it hiking, or even rock climbing without a care because you have not invested much in it to start with. The great thing about a travel guitar is the freedom and convenience it gives you. Don’t ever miss a practice session, and take advantage of all the practice time you can, by always having a guitar at your side. You will probably benefit from that when you get back to your main instrument, and it will feel even better.